We’ve talked a lot on SaaStr about how to get from $1m to $10m, $2m to $5m, $10m to $30m, etc. etc. One area we haven’t talked as much about is getting from say $100k in ARR to Initial Traction, or $1-$2m in ARR. A bit, but not as much. 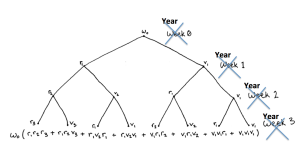 The reason is while I believe for a Given ACV, everyone sort of scales the same way after Initial Traction … we all find different ways to get to Initial Traction. To the first $1m in ARR, to do the Impossible. Some of us are good at outbound, and we literally network and call and email our way to $1m in ARR. Others are content marketing geniuses and build a mini-brand abnormally early. Others are great at PR. Or smothering what few leads they do have with love. We all hack our way to $1m in ARR a bit differently, albeit from the same general large playbook. So when someone asks me at say $8k a month in MRR, from say 30 or 50 or 100 customers or whatever … how they can get to $1m ARR faster … I really have only two answers. One tactical, one strategic. The tactical answer is this: Double Down on Whatever Has Produced You Even a Single Customer. Because since no one has ever hear of you, any possible subvertical, any channel, any keyword, any blog post that gets you just one single customer … will get you at least one more. And probably 10 more. So double down your time and efforts on anything that has even remotely worked. My strategic answer is this: Whatever you do, make your first 10, 20, 30, 100 customers happy. The thing is, this probably won’t help at all getting to $1m in ARR any faster. Yes, your first customers will refer you to others, get you more leads. Absolutely. It will work. It always works, as long as you make them truly, attitiduinaly loyal. (More on that here). The problem is time. It turns out in B2B it’s there, it’s just usually, a lot slower. Eight months from one paid customer to product another, on average. Sometimes faster, of course. Sometimes far, far longer. And often in took multiple exposures (say 3) before someone would really get going and buy. So for the first year, that was incredibly painful. Because we had so few customers in the early days, that even after 8 months, they could only beget us a handful. It really wasn’t until the end of Year 2 that viral really kicked in. That’s just the math of a low viral coefficient. And it didn’t even get good until Year 3, when we finally had a large enough installed customer base, using the product, to become our second largest source of new customers. Today the best SaaS companies are scaling faster, so you may see material results faster. Maybe. But you still have the physics of lower viral coefficients to overcome. I’d say typically, SaaS apps don’t have enough customers to see the material, economic benefits of viral revenue until they cross $1m-$2m in ARR at the earliest. You may see hints of it before, and in your leads, but usually, there aren’t enough customers or time for it to move the needle as a material revenue contributor before then. Now, if you’re building a free B2C app, where you need tens of millions of users to get to Initial Scale, that’s a disaster. 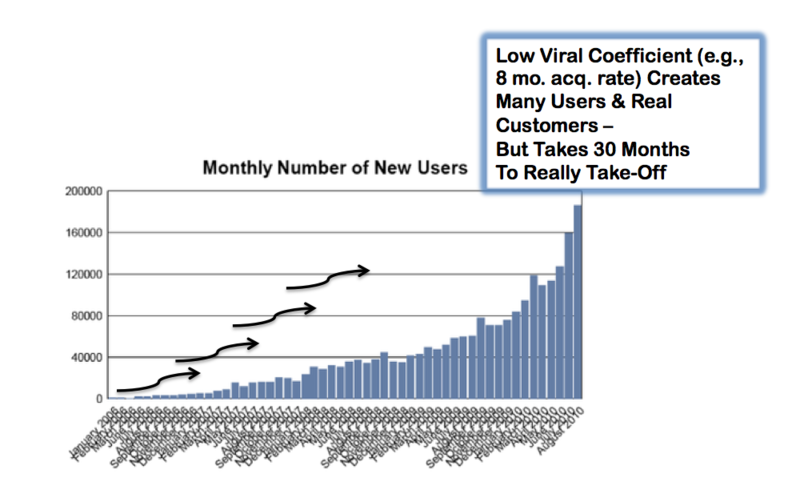 But in SaaS, when you’re on a 7-10 year journey to $100m in ARR, it actually doesn’t matter that much if your viral coefficient is low when you get the viral customers. Faster is better of course. But it’s all still good, so long as it comes and it’s not the only source of new customers. And when it does come, it comes on materially, and strong. So what’s my point? My point is Viral is a Medium and Long Game in SaaS. It can’t make you in Year 1, usually. Sometimes, e.g., DropBox (muchly) or Slack (maybe). But not usually. But it can help in Year 2, maybe materially. And then really take off after that. But it’s no short term magic card. Epic in the long run, but potentially immaterial in the early days. Just plan around that for your so-called “viral” SaaS app.